Via the Art of Hosting emaillist Toke send us a harvest document that talks about Participatory Leadership. This is in other language the worldview that we train people in, in The Art of Hosting Meaningful Conversations. Here it is for you to enjoy! How do you explain participatory leadership in one sentence? o Imagine… a meeting of 60 people, where in an hour you would have heard everyone and at the end you would have precisely identified the 5 most important points that people are willing to act on together. o When appropriate, deeper engagement of all in service of our purpose. o Hierarchy is good for maintenance, participatory leadership is good for innovation and adapting to change. o Complements the organigramme units with task force work groups on projects. o Look at how well they did it in ….. – We could be the ones everybody looks at. o Using all knowledge, expertise, conflicts, etc. available to achieve the common good on any issue. o It allows to deal with complex issues by using the collective intelligence of all people concerned & getting their buy-in. 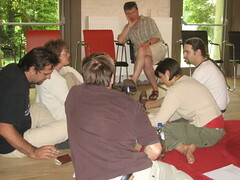 o Participatory Leadership is methods, techniques, tips, tricks, tools to evolve, to lead, to create synergy, to share experience, to lead a team, to create a transversal network, to manage a project, an away day, brainstorming, change processes, strategic visions. o Consult first, write the legislation after. One-to-many information meetings ->A participatory process can inform the information! Information sharing ->When engagement is needed from all, including those who usually don’t contribute much. (This is the text of my recent Newsletter – with an addition by Ashley Cooper). We had good conversations over lunch in Bruges, one of the most famous and picturesque cities in Belgium. We had walked on the boardwalk in the port of Ostend; I had taken a long walk on the beach while he took a nap. Now we found ourselves in a restaurant at the beach, eating fish. and I replied. No – I reacted. I could feel it immediately! 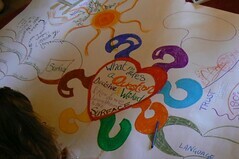 There was an emotional charge in my tone; I was out of my center and in a position of making sure my point came across. I stopped and asked if I had been harsh/hard on him. But I didn’t need to ask, I knew it already. My body had told me. This to me is an example of embodiment of consciousness; a sensing so fine that it can distinguish the subtle differences between actions coming from ego or from our center. I see a rise in the importance of embodiment. Both in new, innovative ways like The 16 Ways of Dylan Newcomb, the fascinating world of Take Tina, and in my own co-hosted program of Women Moving the Edge. Also in the mastery of lineages that are applied to our current times, like the Conscious Embodiment of Wendy Palmer and the Warrior of the Heart; both sprouted from the old roots of Aikido. Open to subtle sensing of yourself, the other and what is in between. And being able to return to it easily when you lose it. When the world gets complex and chaotic. It’s about being ready for the times ahead. Please don’t suspend till later. These times are approaching rapidly. And being able to return to your inner ground easily when you lose it. Like Chris Corrigan, a Canadian Art of Hosting friend, I’m holding questions, or I live in questions. Lately I noticed that conversations that don’t hold a question – somewhere in the middle, somehow conscious or not – can’t keep my attention for long (anymore). I seem to be addicted to the sense of aliveness that goes with conversations around a question. I know, if we hold questions together, something really life-affirming can come out of it! What is the next level of my Work, and how do I not get in the way (of its unfolding)? What is professionalism in networking and stewarding? What is the bigger whole that I am serving? What are the questions that you are holding??? Fabulous list of weird questions! When you hear the term “sacred questions”, are there some coming to your mind that you would name sacred questions? How would my experience of you be, if you are shining in your brightest light, radiating pure energy, being fully aligned with your passion? You have 5sec on a stage where every human on earth will watch you – what would you do and say? We are before the BigBang – you are god(ess) and you can choose which area(s) of the unborn world you take responsibility to create. You are currently browsing the Seeds for a happy planet blog archives for August, 2009.